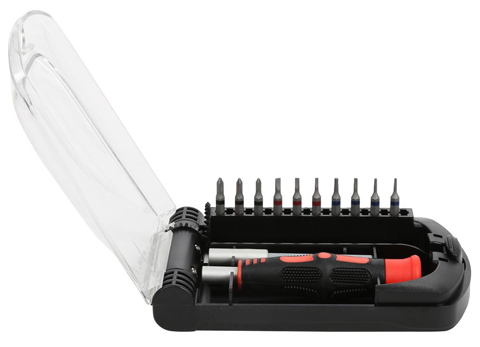 This Rosewill 12-piece screwdriver set is a must-have for home users to fix desktops, laptops and other electronics or work on projects around the house. This precision screwdriver set is built with premium quality material and manufactured with meticulous craftsmanship, ensuring exceptional strength and durability for trouble-free use for years to come. All tools are demagnetized to protect magnet-sensitive devices or media from damage. The included storage case keeps everything neatly organized, and is convenient enough to take on the go. All tools are demagnetized to prevent systems and magnetic media from damage.